The Body of this Crab is round; The Legs larger and longer than in other Kinds, the Claws red, except which, the whole is motled in a beautiful Manner with Red and White. 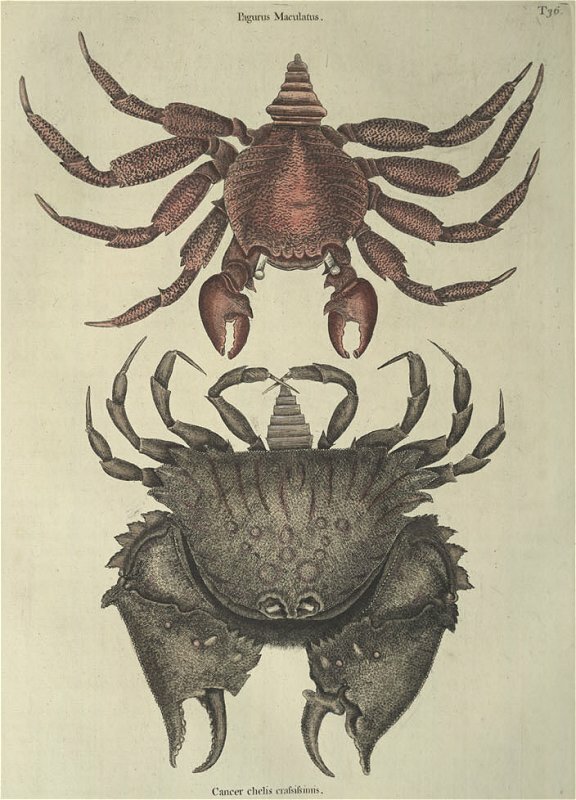 These Crabs inhabit the Rocks hanging over the Sea; they are the nimblest of all other Crabs; they run with surprising Agility along the upright Side of a Rock, and even under Rocks that hang horizontally over the Sea; this they are often necessitated to do for escaping the Assaults of rapacious Birds which pursue them. These Crabs so far as I could observe never go to Land, but frequent mostly those Parts of the Promontories and Islands of Rocks, in and near the Sea, where by the continual and violent Agitation of the Waves against the Rocks, they are always wet, continually receiving the Spray of the Sea, which often washes them into it, but they instantly return to the Rock again, not being able to live under Water, and yet requiring more of that Element than any of the crustaceous Kinds that are not Fish. These Crabs are usually of the Size of the Figure, and are commonly taken from the Bottom of the Sea in shallow Water, the Legs contrary to the precedent are small in Proportion to its Body, the two Claws remarkable large and flat. But as the Structure of this Fish is so much better understood by the Figure of it than by the most tedious Description, I shall only observe that the whole Shell is covered with innumerable little Tubercles, resembling Shagrine: The colour of it is brown variously stained with purple: The Structure of this Crab is singular, and in nothing more than the nearness of the Eyes to one another, and the uncommon Width and Largeness of its Claws.